Both the Pro-Gear Bionic Wrench™ and the Pro-Gear Bionic Grip™ feature a new Interlock™ mechanism that stays locked while under torque load, and an electrolysis nickel plated finish, making them ideal for professional-grade applications. 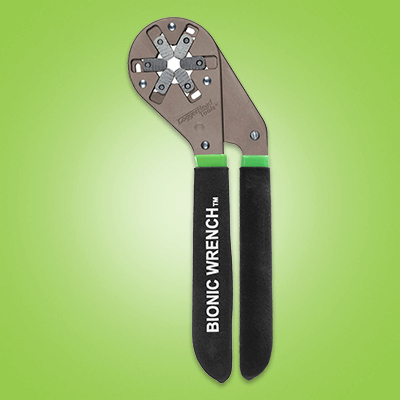 6 inch Bionic Wrench™ covers 6 SAE sizes, 1/4, 5/16, 3/8, 7/16, 1/2, 9/16 inch, and 8 Metric sizes, 7,8,9,10,11,12,13,14mm. 8 inch Bionic Wrench™ covers 5 SAE sizes, 1/2, 9/16, 5/8, 11/16, 3/4 inch, and 9 Metric sizes, 12, 13, 14, 15, 16, 17, 18, 19, 20mm. 10 inch Bionic Wrench™ covers 8 SAE sizes, 3/4, 13/16, 7/8, 15/16, 1, 1 1/16, 1 1/8, 1 1/4 inch, and 10 Metric sizes, 19, 20, 21, 22, 23, 24, 25, 26, 27, 30mm.